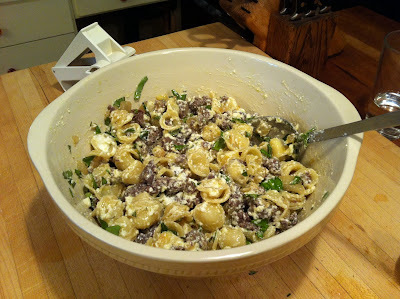 I've been making this recipe for years and it never fails, so simple and a bit different than most pasta dishes. I start by sautéing two quartered and sliced Vidalia onions and two garlic cloves in a large pan with extra virgin olive oil. At this point I drop my orecchiette pasta into boiling water although any smaller shaped pasta would be great, farfalle, ziti, or campanelle for example. Then, with a sharp knife I slice through six Italian sausages making sure to split the casing from end to end so that it can be easily removed. I crumble the sausage meat into my pan with the onions and garlic and as they cook try to break up as many of the larger pieces of meat as I can with a metal spoon. In less than ten minutes when my sausage meat is cooked through I test the mixture and add kosher salt and pepper to taste. After draining my pasta I drop it into a large bowl, top it with the onion and sausage mixture, a few splashes of extra virgin olive oil, a 16 oz. container of the best ricotta you can find (I used Mablebrook Farm), and a generous handful of chopped basil. 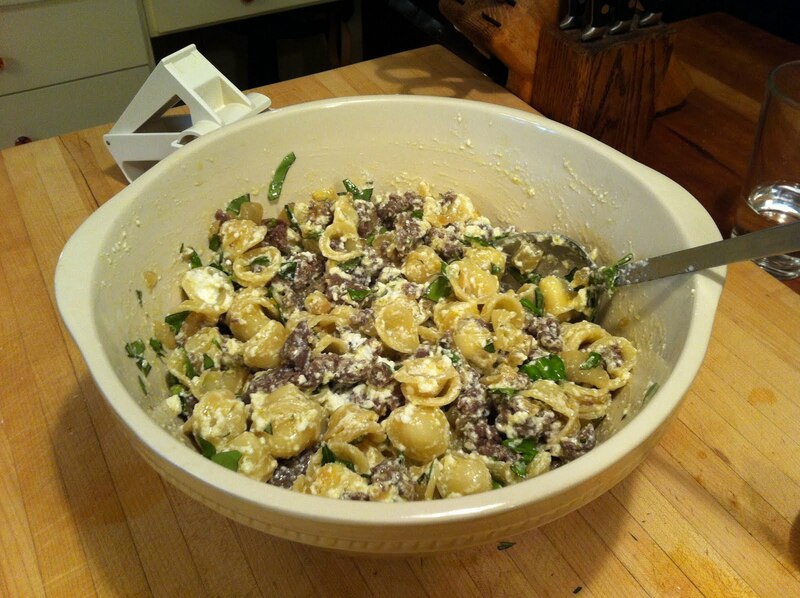 I mix until the ricotta evenly coats the noodles and serve topped with some grated parmesan. It's that easy!